At this exact moment, Spenser and I are sitting at a tiny table in the Hong Kong airport. We have 2 hours until our departure, no assigned gate, my comically large backpack, and time. Lots and lots of time. We may have two hours now, but we have a good five hour layover in Kuala Lumpur after our first flight (yay), and THEN we arrive in Bali…at 2:30 am. It’ll be great. Consequently, enjoy a blog post about our adventures with our friend (yes, we have friends) Paige. Paige is from Baton Rouge and we met her at Tulane long ago. She’s a super cool lady and, when I told her back in March that we were moving to China, she did her usual Paige thing and said, “I’m going to visit you. I’m not even kidding.” Sure enough, Paige kept her word and arrived in China with her lovely cousin Amanda. 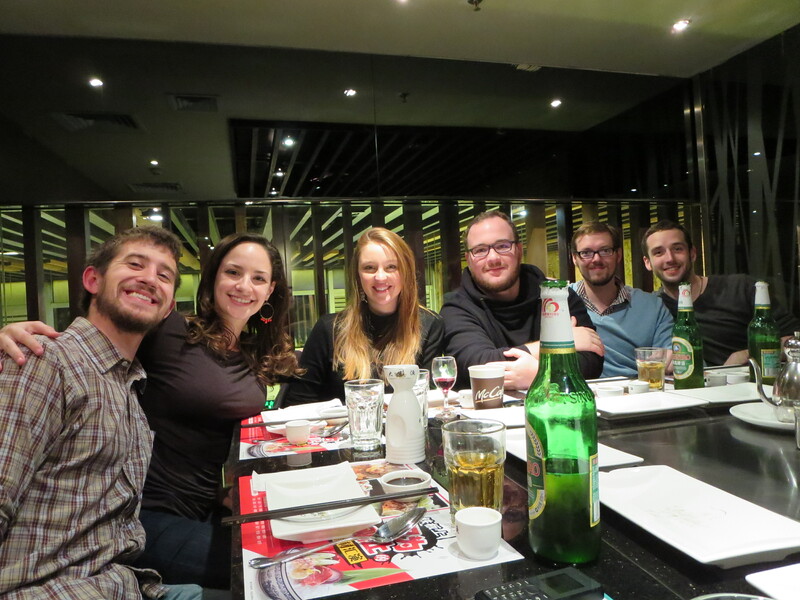 They flew into Beijing on Christmas and traveled by themselves for a bit before meeting up with us in HK. To put it simply, we had a helluva time. Naturally, we kicked things off in a very New Orleans “fashion” as soon as they got here. We bounced from place to place the first night and caught up on both new business and old business. Catching up with friends, New Orleans style. Making new friends…with the waitress! The next day, feeling slightly wobbly, we decided to take it easy and have a late start. 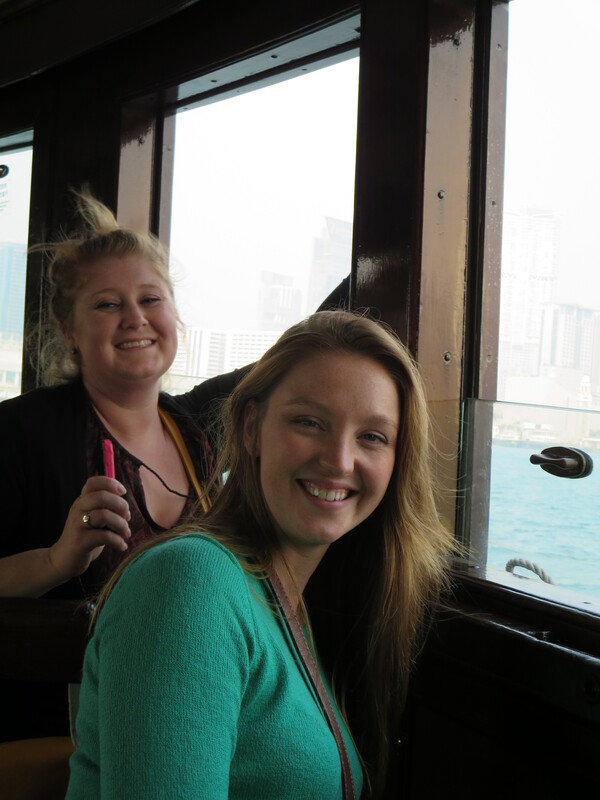 We rode the MTR out to Lantau Island and explore the area around the great bronze Tian Tan Buddha. 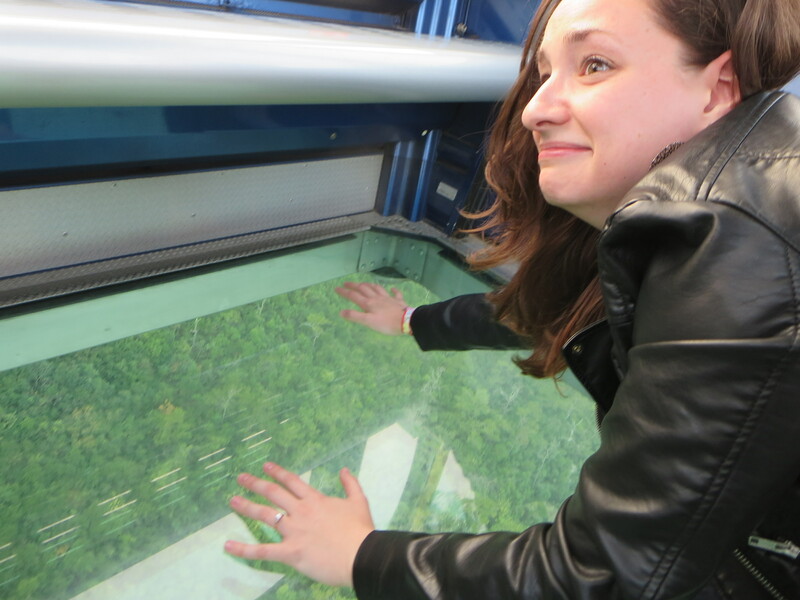 What I was not expecting, however, was a glass-bottomed gondola ride that went WAY too high in the air for my taste. Everyone else, however, loved it because they’re crazy people who should be way more afraid of heights. 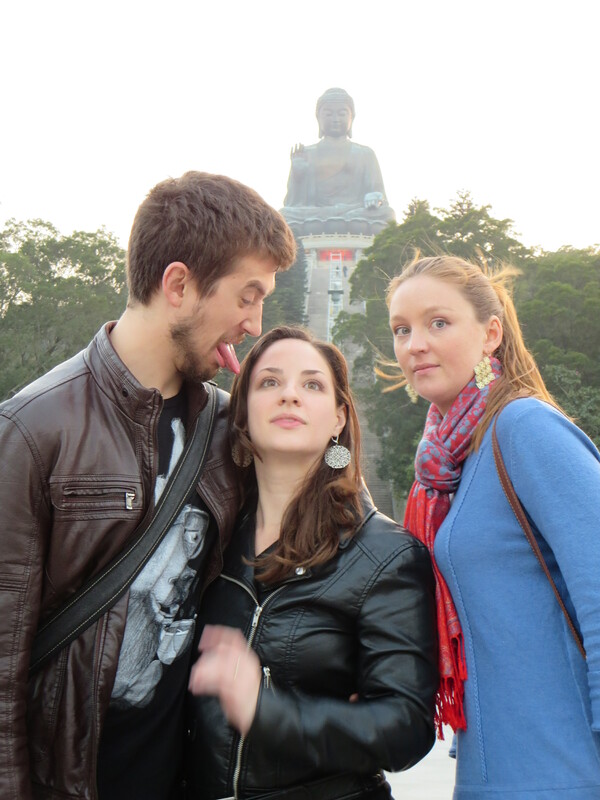 We had just enough time to run up to the steps of the Tian Tan Buddha, take some pictures, and run back to the gondola before we would be left behind, but we all still had a wonderful experience in a short amount of time. Immediately after this, the cow tried to snuggle with me and it was terrifying. We took her to the “famous” Yantian Seafood Street and ate many fine delicacies, including a gigantic crab and some gooeyduck (the…um…weird looking shellfish). Paige picking out her meal. Gooeyduck is from Alaska and considered to be a true delicacy in China. Naturally, we had to try it. Spenser picking out a tasty crab. 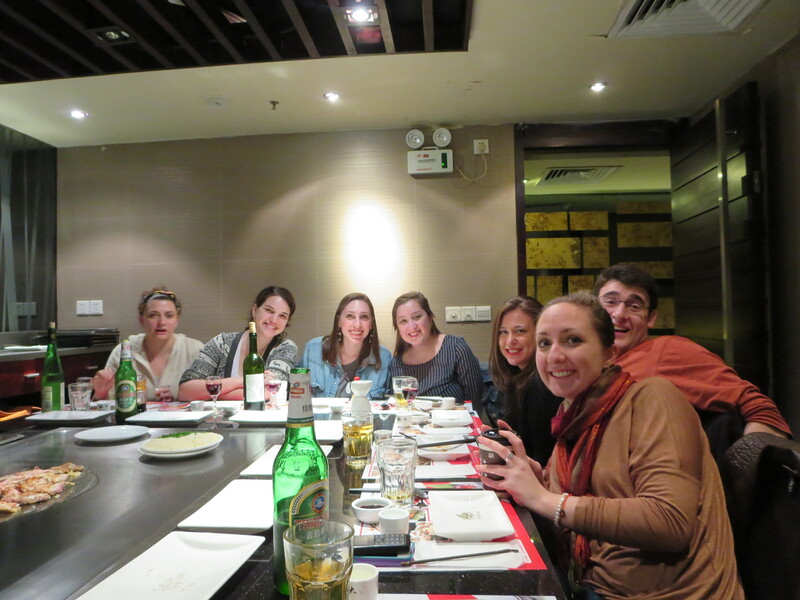 We also took her to teppanyaki with our CTLC friends! It was SO much fun! 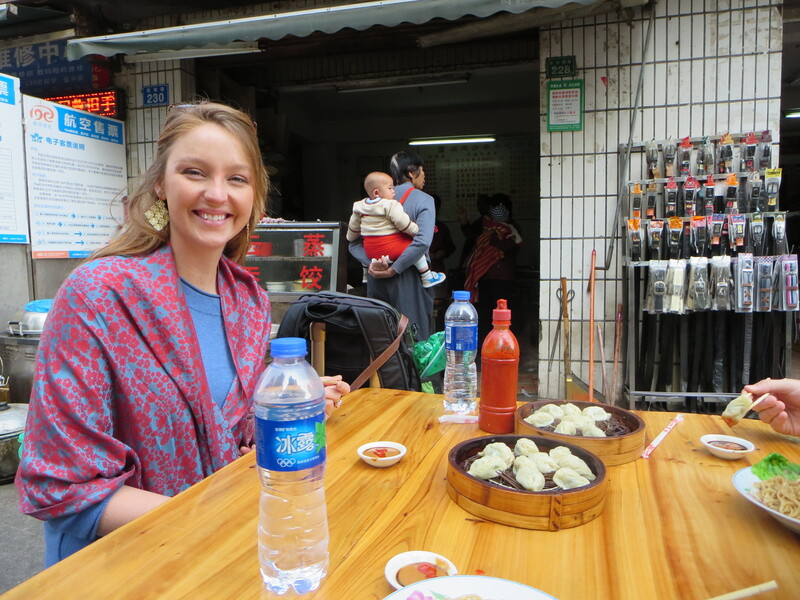 And, on her last day in Shenzhen, we took Paige to the world famous Toilet Restaurant. Yes, our chairs were toilets. Fake poo was everywhere. All the food was served in toilets or squatty pottys. It was very weird and the ice cream tasted like…not very good. All in all, I’m so glad Paige kept her word and decided to visit China. We had a blast. It was great at times, exhausting at times, and weird at other times, but all these times were extremely memorable. When we come home, there will be at least one person who understands the trials and tribulations we dealt with on a daily basis and how absolutely wonderful and completely weird this new home is. Thanks for visiting friend! Sweet! I finished this blog post with 30 minutes left before we take off for Kuala Lumpur. Cool. Now we’re all up to date again. Whew. Ok, check back here often over the next few weeks as Spenser and I are going to try to blog from our various vacation spots! Weeeeee! Happy travels!